The idea of creating a group called Val Gardena went back to the mid 80’s. I just liked the sound of the name and the ambiguity around it’s identity. Most people don’t seem to know it is quite a beautiful place in the northern Italian alps, famous for some of the best ski slopes in the world. In 1993, I was beginning to lose touch with my creative side after several intense years working at PolyGram. I came to the conclusion the best way forward was to start writing music again. I called on a close friend and sometime musical collaborator, Jeff Leonard, to help in this journey. To my amazement, Ed Eckstine, the President of Mercury Records, recognized something special in the music and signed Jeff and I to a three album deal. Thus began Val Gardena and a musical partnership that has lasted over twenty years. 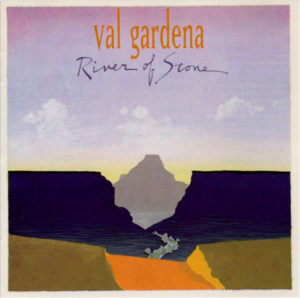 River of Stone was our first album and it reflected a rather clear vision that I had for the music. Instrumental, melodic, and atmospheric. We tried to avoid the “New Age” banner but we fell into that category regardless. “Instrumental” on it’s own did not really exist and although “Soundtracks” would likely have been best, the music was not part of any film. As with all the albums, we recorded everything in Portland, Oregon with engineer Bob Stark. Bob continues to work with us and he and I have gone on to write and produce an every growing catalog of music. He has been an invaluable member of the creative team.